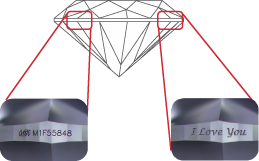 IGI's unique United States patented process to laser inscribe numbers, letters, trademarks, and logos on the girdle of a diamond allows the diamond to be easily identified. The inscription is visible under 10x magnification. This process does not affect the quality of the stone and is permanent provided the diamond is not repolished. Diamond manufacturers are now able to create their own brand name diamonds distinguishing their stones over the competition. Consumers now have the ability to easily identify their diamonds, and have the option of placing a personal message on the stone. IGI's patented LaserscribeSM, combined with the standard of excellence and recognition of IGI's traditional Diamond Grading Reports assures you of both the quality and the positive identification of your diamond. A miniature copy of the IGI Report is enclosed within the seal, and is visible from the back. Once opened, the IGI Seal will show a chemically generated pattern, evidencing that the seal has been opened. In addition to being assured of the quality and value of one's fine jewelry by purchasing IGI graded product, consumers may also protect that valuable investment at a significantly discounted rate for the life of their jewelry. Click here to find out more about personal jewelry insurance.